Your home security lock is really safe? Consumers Association issued a consumer warning that the security door a lock dozens of seconds or even a few seconds can be opened, called on consumers to replace a more secure B lock core. Consumers Association has done a random sample survey, found that more than 50% of users are still using a level lock, some of the old district with the majority of this lock core. Consumers Association pointed out that with the development of this kind of lock unlock technology, security decline. 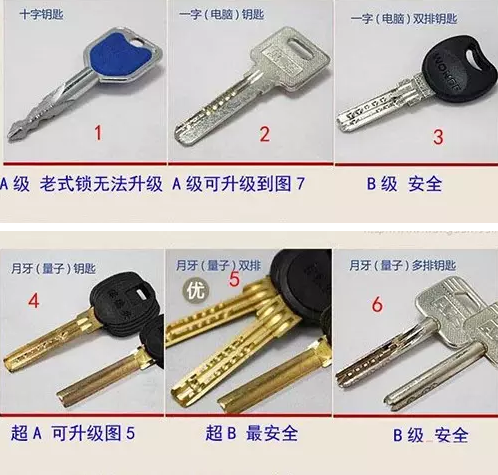 Now the use of anti-theft lock is divided into three levels: Class A, B, ultra B. Anti theft lock core level determination, we can distinguish from the key. The best way to identify the level of anti-theft lock is to use the key to identify, a look at the key will be able to easily understand the level of anti-theft lock! As we can see from the chart, the more complex the key, the higher the level of anti-theft lock, the more secure. The lock core level judgment can look at the key to identify. We usually buy a lock must not look at the design of the handle of the key, the most critical or the design of the key itself! Currently on the market a class a burglar proof lock key is mainly a word key and cross key. A lock core internal structure is very simple, only changes in marbles, marbles and shallow groove less. Anti technical opening time of 1 minutes, the high rate of open. Spring is a single row of marbles or cross lock. 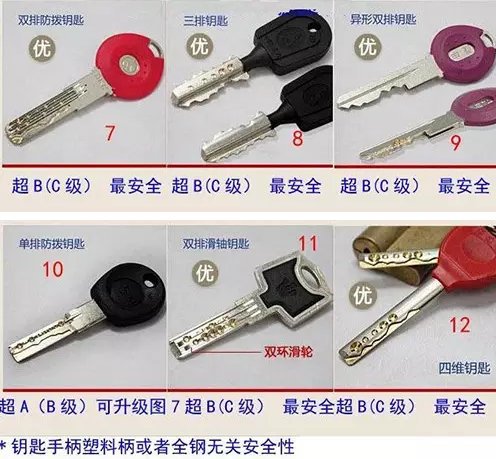 B flat key lock key is, a double cylinder slot, with a lock key difference is that more than a row of crooked face irregular lines. The main type of lock core 3, computer double lock core, double crescent lock core, double blade lock core. The technical opening time is 5 minutes, and the mutual opening rate is high. Through the strong torsion tool, 1 minutes can open the lock core. Generally in the district where the majority of the unified configuration of the lock core and more for the anti technology to open a low level or B level anti-theft lock core. In accordance with national standards, class a lock core technology to open a time of 1 minutes, B lock core technology to open time for 5 minutes. And just a few minutes, unable to fight high intelligent unlocking tools now use the thief, a common anti-theft lock core in the locked state, the thief use aluminum foil with the tool, just a few seconds to open. The key shape is one side blade inner milling groove or the outer milling groove key, the lock core type is the side column lock core; the public security department detection 270 minutes can not be opened, the regional mutual opening rate is zero (1/16000000). A structure of double row blades with V type side column lock; if the tool with a strong twist open the lock core, the lock core internal damage, blew locked, making it impossible to open. Due to not easy to open, the highest security coefficient, family security is recommended using super B level lock. Guangzhou Bai Jie Electronic Technology Co., Ltd. is a company engaged in intelligent door development, production and sales of integrated companies, Bai Jie electronic ITPAKO series CPU non contact Carmen ban, on-line intelligent lock and IC Carmen banned a series of products with excellent performance have accumulated solid foundation, to provide enterprises for the current domestic market the earliest the industrialization of the non-contact CPU card and biometric application system equipment, is the domestic counterparts in the most potential, the most technology industrial enterprise development scale, the relevant state secret algorithm products meet the requirements of the State Password Administration access encryption standard, ITPAKO will successfully create a domestic smart card industry leading brands. The company's products and strategies across the hot topics and is based on the Internet of things, intelligent Home Furnishing and Internet plus other related industry platform.